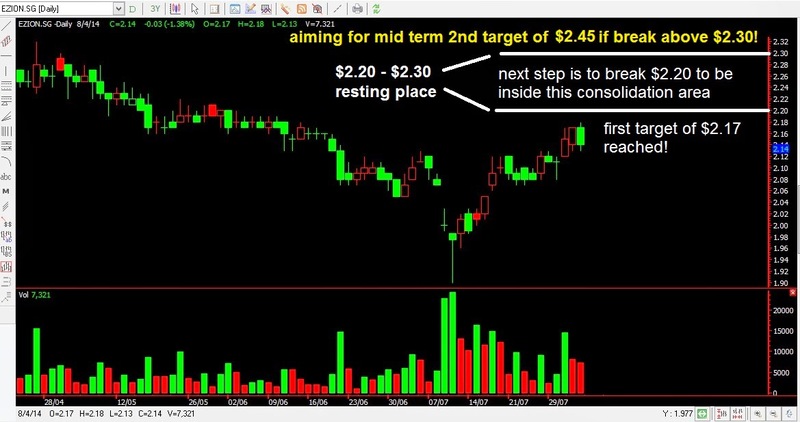 Ezion swiftly followed our prediction to reach $2.17 within a few days. We think that with its growth rate, it still has potential to go up. But because it hits our resistance target of $2.17, it may need to rest for a few days. But I don't think this mid term run has ended. Our next target is that it will break above $2.20 to be in $2.20 to $2.30 region. After at least a few days of consolidation again, and if it breaks $2.30, it is heading for $2.45! At $2.45, this stock will need a long rest. Let us see if we are right in charting out the flight of this stock! Sometimes we are also amazed by our accuracy! Ha..